I only recently discovered Seattle’s GREYHAWK myself, not knowing exactly what to expect when I received a PR email about their releasing a new EP. At that time, little did I know what awaited when I decided to check out the band’s début release, the recently issued, six-song ‘Ride Out‘ EP. Being that Seattle was involved, I half expected some somber, atmospheric doom or sludge, two particular genre styles being well represented by bands from that area right now. Boy, was I wrong. Way off the mark, in fact, yet pleasantly surprised to learn that GREYHAWK are unquestionably a heavy metal band. Not just any run of the mill, recycled, by-the-numbers metal that seems to permeate things in an over abundant way these days, no. GREYHAWK – Rev Taylor (vocals), Jesse Berlin (guitar), Enrico Marriuzzo (guitar), Darin Wall (bass), and Nate Butler (drums) – are practitioners of classic metal influenced, modernly executed power metal. Such that is quite multifaceted, dynamic, and absolutely exciting, hearkening back to such acts as Sanctuary, Fifth Angel, or Helstar. Songs like “The Abdication” (and its brief intro piece, “Covenant“), title track “Ride Out“, and “The Serpent King“, are uptempo, high-powered, riff-driven numbers. They are structured upon chugging rhythms and fierce drumming, while delivering a wide range of vocal styles to top them off. The latter track, “The Serpent King“, is a battering rampage of fantastic guitar acrobatics and solid vocals of a nature that falls somewhere between Rob Halford and Warrel Dane. The pair of tracks that fall near the last half of the EP, “Wisdom Of The Wizard” and “Circle Of Heroes“, are especially thrilling compositions. The first, “Wisdom Of The Wizard“, is a bluesy, simmering heavyweight that ripples with vibes of Eighties metal at certain points, all built around one hell of an infectious guitar riff. “Circle Of Heroes” is quick to unfurl its galloping rhythms as tight twists and turns come in fast as the song barrels its way ever onward. 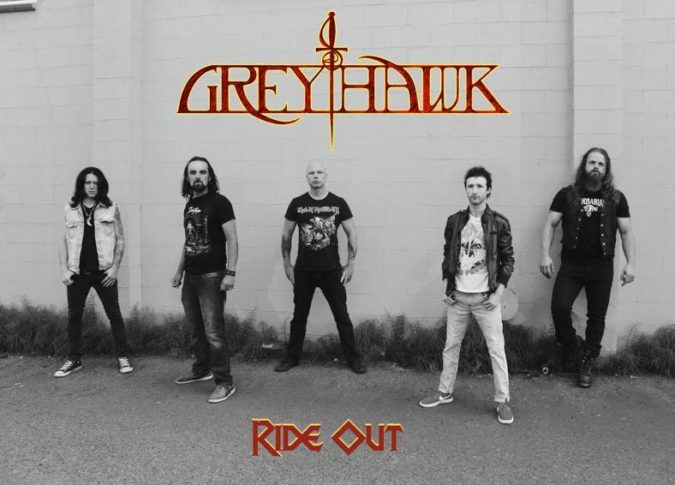 GREYHAWK deliver a remarkable record with their official first time out, the ‘Ride On‘ EP, and I suggest you hop on and take your own trip with it via the stream provided above. You can also trek on over to Bandcamp HERE for further streaming and purchase options.